During field observations between 15 and 27 November 1990 no eruptive activity was observed . . . . Reports of miners working SW of Pular (closer than the April witnesses, who were 75 km NE) suggest that the 24 April eruption never took place. Information Contacts: M. Gardeweg, SERNAGEOMIN, Santiago. The Global Volcanism Program has no Weekly Reports available for Pular. Witnesses reported that "on 24 April at 1100 on a clear day with no clouds, a small eruption took place from Pular. It produced an explosion heard at El Laco (a Pacific Mining Company iron mine located 75 km NE; figure 3) and a column of black smoke that lasted just a few minutes above the summit, similar to those observed recently from Lascar." [but see 16:01] Geologists noted that the source of the 24 April eruption remains uncertain. Pular is believed to be Pleistocene in age. Figure 1. Sketch map of a portion of N Chile showing the locations of Pular and nearby volcanoes, and El Laco and other population centers. Courtesy of M. Gardeweg. The summit and flanks show signs of deep glacial erosion, including lateral moraines as low as 4,100 m. Pular is the northernmost member of the chain of volcanoes that bears the same name (Cordon Pular). None of the chain has had historic volcanic activity. Cerro Pajonales (24.20°S, 68.10°W), a satellite vent of Pular (5 km SW of the summit; figures 2 and 3), is a lava and dome complex believed to be Quaternary in age. Although evidence of glaciation has been noted on Cerro Pajonales, geologists believed it to be a more likely source of the recent activity. Figure 2. Sketch map of Pular from the Sierra Almeida quadrangle (map SG-19-3-4, 1:250,000, Instituto Geográfico Militar, Chile). Figure 3. Geology map of Pular and surrounding region. Based on Gardeweg and others (in prep.) and Ramirez (1988). References. Gardeweg, M., Ramirez, C.F., and Davidson, J., in prep., Hoja Sierra de Almeida, Region de Antofagasta (1:250,000): Carta Geológica de Chile, Servicio Nacional de Geología y Minería. Ramirez, C.F., 1988, Evidencias de Glaciación en el Macizo de los Volcanes Pular y Pajonales, Región de Antofagasta: Actas V Congr. Geol. Chileno, Tomo II, p. D143-D157. Information Contacts: M. Gardeweg, SERNAGEOMIN, Santiago; Vinicio Travisany, CMP (Pacific Mining Company). Cerro Pular on the NE end and Cerro Pajonales on the SW form a 12-km-long volcanic ridge NE of Socompa volcano that is mostly pre-Holocene, but may have experienced some more recent activity. The chain lies NW of the Salar de Pular, about 15 km W of the Argentinian border. Extensive andesitic lava flows reach the lower flanks of the volcanoes, and about 10 craters are present. A major satellite vent W of the ridge appears to be the youngest feature of the volcanic complex. An uncertain small explosive eruption was reported in 1990, but the vent location was not known. There is no Deformation History data available for Pular. There is no Emissions History data available for Pular. 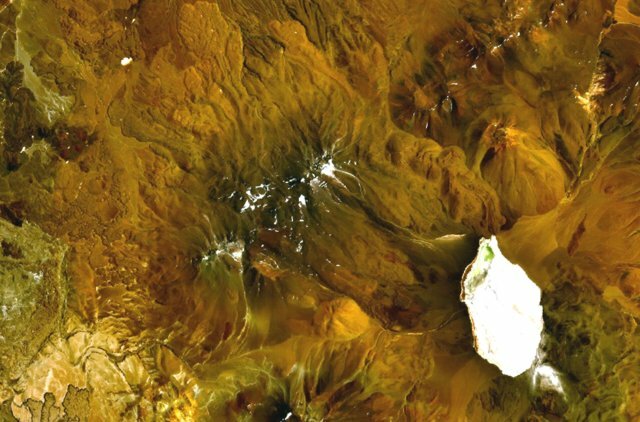 The peaks with scattered snowfields near the center of this NASA Landsat image (with north to the top) are Cerro Pular on the NE and Cerrp Pajonales on the SW. The 12-km-long volcanic ridge lies NW of Salar de Pular (lower right) and NE of Socompa volcano, source of the lobate lava flows visible at the extreme lower left. Andesitic lava flows from the Pular-Pajonales chain overlie dacitic lava domes. An uncertain small explosive eruption was reported in 1990, but the vent location was not known. There are no samples for Pular in the Smithsonian's NMNH Department of Mineral Sciences Rock and Ore collection. Large Eruptions of Pular Information about large Quaternary eruptions (VEI >= 4) is cataloged in the Large Magnitude Explosive Volcanic Eruptions (LaMEVE) database of the Volcano Global Risk Identification and Analysis Project (VOGRIPA).